Coach Max Ivany founded Texas Basketball in the year 2000. It has since evolved into what is known as the D1 Nation with a presence in 10 States and Canada. The D1 Ambassadors club has now become the largest club of college prospects in the United States. Adidas has partnered with the D1 Nation; with the Texas D1 Ambassadors being the one and ONLY OFFICIAL Adidas club in the Killeen-Austin-San Antonio area. In fact, there has never been another shoe affiliated club from the area in the last 30 years on the men's basketball side. Coach Ivany is one of a handful of Adidas Grassroots Consultants nationally who evaluate and nominate players for participation in the Adidas Gauntlet Series, the Adidas Unrivaled Camp and the prestigious Adidas Nations. Coach Ivany has personally coached over 120 Division One players. The organization boasts 8 NBA draft picks and a Heisman Trophy winner. among it's alumni. The D1 Nation in it's entirety now has close to 300 Division One alumni and a number of professional players. 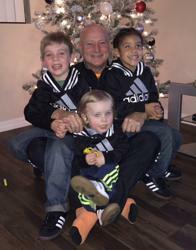 Coach Ivany has two sons: Mark and Chip as well as three grandsons; Noah, Luke and Julian. Coach Ivany's recruiting eye is renowned and his evaluation insight is unparalleled as it's not only text book insight. 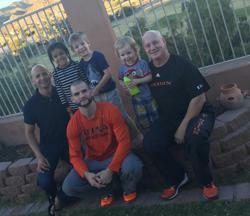 He and his family have lived the basketball life. Total scholarships earned by our athletes are closing in on $50,000,000! (based on the national median of $162,000 per athlete for room, board, tuition, travel, medical care for 5 years of college education). The majority of NBA and NCAA coaches and decision makers are on his speed dial. Chip Ivany was an outstanding Texas High School player who amassed over 1500 points in his high school career, culminating in a Texas Regional Final with Pflugerville Connally in 2006. 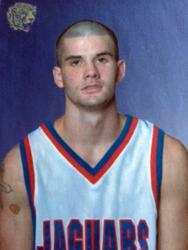 He played one year of junior college (Hill JC, Texas) before moving on to the D1 ranks. He has one son, Julian (6) and is married to All American Judy Jones. Coach Ivany's daughter in law Judy Jones was a standout at Monroe Wossman (LA) where she was an All State honoree in basketball. She was also a 7 time Louisiana State Champion in track: high jump, triple jump and 400 meters (4 times). She also won the 400 meters at the Texas Relays and has never lost a competitive race at that distance and is world class in this event. Judy has endured the D1 ranks, including redshirting between her freshman and sophomore year to give birth to my grandson, Julian Ivany. She then suffered a near career ending injury in 2012 after starring her first two seasons for Texas-San Antonio. Thanks to the San Antonio Spurs medical staff, coupled with her will and drive she fully recovered. She then became an All American in the 2012-13 season for her new school Grand Canyon University. In addition to All American Honors and Conference Player of the Year she was also named Conference Scholar-Athlete of the Year (3.98 GPA). Judy graduated with her Bachelor's in Kinesiology & Exercise Science in December 2013. Judy was also named one of the final 40 for Academic All American in the 2013-14 season and completed her Master's in Special Education in May of 2015. After twice being named WAC Player of the Week, her career was abruptly derailed by a torn ACL. She underwent surgery in early January 2014 and is underwent rehab for the next 6 months. Judy accepted a position as a graduate assistant on the Grand Canyon University basketball for the 2014-15 season, while pursuing her master's in Special Education. Jones has now resumed her career in the professional ranks. Turning professional, she won the Phoenix (AZ) 3 on 3 title with former Olympian Ruthie Bolton Holifield the past two seasons. She has played in Poland, China & now stars for AE Mataro in Barcelona, Spain. She has represented the USA 6 times in international play; including against the French, Latvian, Polish and Chinese National Under 23 teams. The future of the D1 Nation is in it's next generation, and this basketball family is blessed to have the smiling face and bubbling personality of my grandson, Julian Ivany to carry the torch for many years to come. Only six years old, he's already in the gym with his daddy at the D1 Nation Skills Academy on a regular basis. I thank you for taking the time to get to know my family. We are a corporate, professional youth sports and recruiting organization with a personal family feel to it. I invite you to entrust your children to our training and guidance as they pursue their dreams and goals.